The 1st Year of our Cafe Farm — Lessons learned and successes earned. On our ten-acre property, less than a mile from our Cafe, four acres are devoted to Sangiovese, Syrah, Nebbiolo, and Cabernet grapes from which we create wines under our private label, Bernat wines. 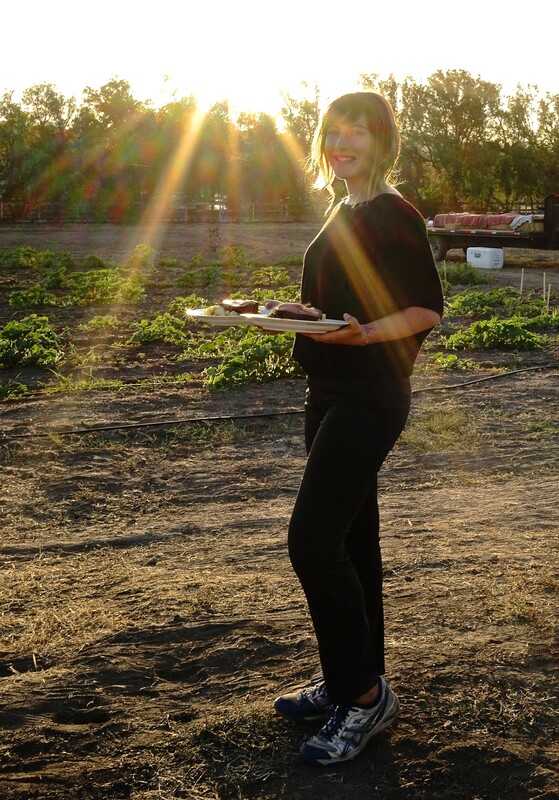 An additional 4-acres of prime land have been cultivated by local organic farmers for themselves through the years, but their focus wasn’t solely on providing produce for our restaurant. When Shu and Debby Takikawa, the last farmers to farm this section of land, took over the 40 acres behind us, Shu encouraged us to farm it ourselves. We were eager to try, but knew well that running a farm along with our current endeavors– a vineyard, winery, wine merchant, and restaurant– we needed help. That’s when we found Matt McCurdy, or he found us, that’s another story. Eager to take on the project and apply his knowledge from his past endeavors– working at our local Windmill Nursery being one of them– Matt leaped in and started planting. Well, first we dived into organic heirloom seed catalogues. We chose all the flowers that would bring the bugs to benefit the farm and would also cut nicely for flowers to put on the Café tables. We brought chef Chris Joslyn into the discussion, and chose vegetables he would love to use for our restaurant’s menu. We’ve been very pleased with seeds from Baker Creek Heirloom Seed Company. Our first summer was full of zucchini and cucumbers. The vision was growing…literally. We played around with various pickling recipes and pickled the cucumbers to place next to our Café’s burgers and sandwiches. Some of them we even put in jars and sold in our retail section, they were a hit and quickly sold out! Well, it’s been almost a year now, our biggest lesson learned is the land has much to teach us. Will Rogers said, “The farmer has to be an optimist or he wouldn’t still be a farmer.” — That’s the truth!– We planted green beans, carrots, beats, and reaped nothing from them. 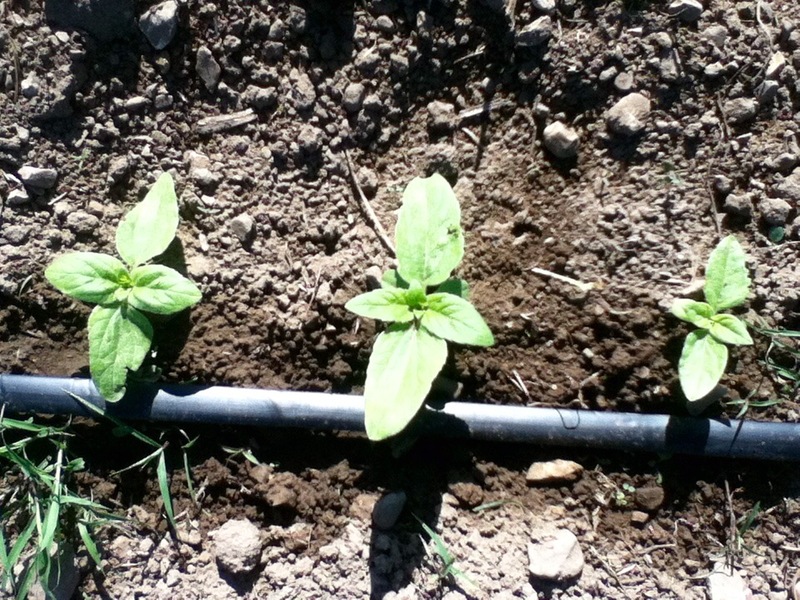 Yes, we watered, weeded, and provided healthy soil and sunshine, but they never ended up on plates at our restaurant. Why you may ask? We initially started by planting a large amount of different types of crops. Planting many different varieties of each plant, gives us an idea of which species not only grows best in each area, but which of those tastes the best. We pay close attention to each plant and learn which ones like which soils, climate preference, and which are affected by pests and how. All of the varieties of Kale we planted thrived through the winter; red lettuce, and romaine were also very successful. Pests have been our biggest problem. 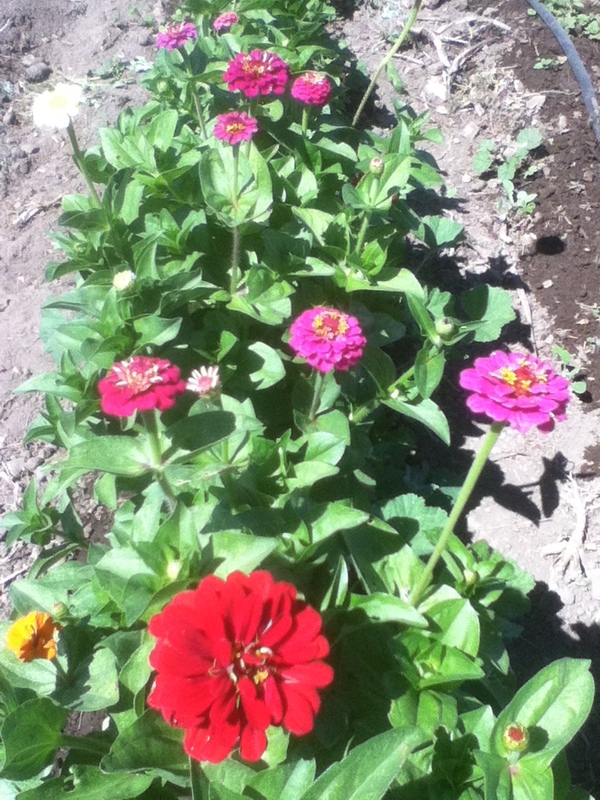 Our first crop was planted when one of our dogs, Gypsy, was on vacation. The gophers and ground squirrels noticed and began moving into the farm. They ate almost all of the green beans we planted. Of 600 plants only 10 survived! They also ate the tops off of the carrot and beet plants. Although losing their tops did not initially kill them, since the plant was working hard to regrow the tops, the produce didn’t survive after all. The other challenge all farmers face, are weeds, we are no exception. Since our farm is CCOF certified organic, using herbicides is absolutely out of the question, not to mention it would deplete the nutrients in the soil and affect the quality of our produce. Being a small farm with only Sam and Matt to do the weeding, we quickly realized that we must be missing something– there was no way we could keep up. The weeds aggressively took over and whole rows had to be plowed back in to the soil before the plants had a chance to grow to maturity. Weeding through the research (yes, that was a pun) of all the various farm equipment to assist with this problem was overwhelming, even to a veteran vineyard farmer, like Sam. It was time to seek the advice of someone who had more experience in large scale farming than us. Sam met with a local veteran farmer, Steve Loyal, who shared valuable information. Steve directed us on the best equipment for a farm our size. 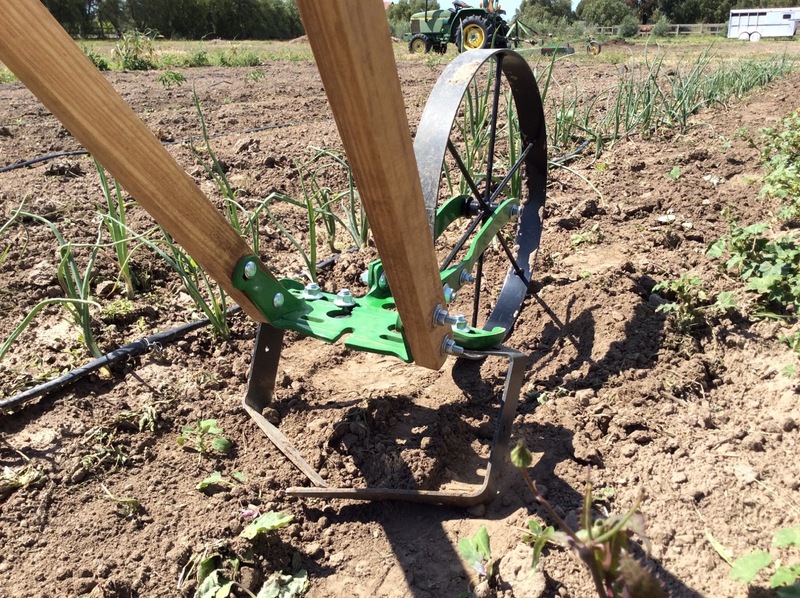 We bought a hand hoe on a wheel that as we push, it slices under the soil cutting the roots of the weeds. Our tractor also needs some additional equipment to mechanize weeding, which we can tell you more about by the next time we post a Cafe Farm Update. We now look forward to watching our seeds grow to their full potential before the weeds can take them over (hopefully). Though we are still in the midst of a big learning curve, we have had much greater success now that Gypsy is back on the job maintaining the ground squirrel population. Thanks to our hard working farm dog approximately 1500 heads of lettuce, 200 pounds of snap peas, and many, many buckets of onion, garlic, kale, swiss chard, arugula, spinach, turnips, and cilantro—came from our Cafe Farm since July 2015. We are getting a healthy head start for this summer with 900 plants of various heirloom tomato varieties in the ground, 10 types of lettuces, and squash and pumpkins ready for fall; we are excited to continue to expand the beauty and bounty on our menu at the Cafe. 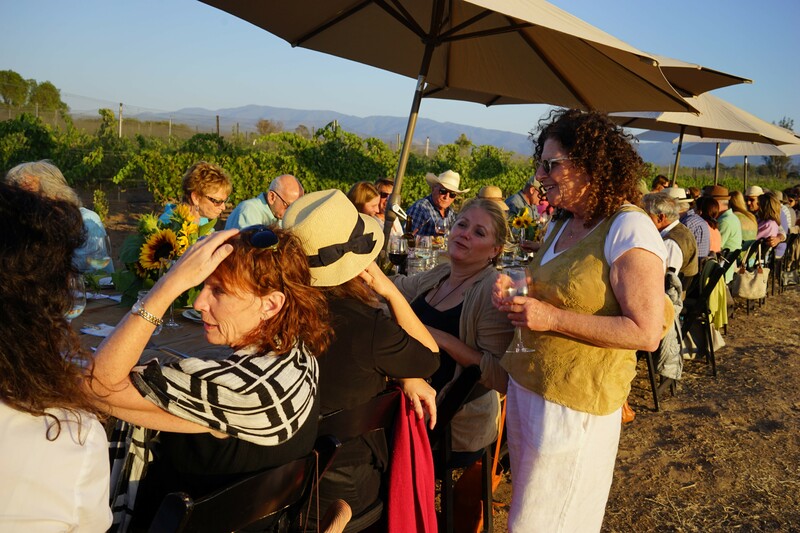 While we are talking about the farm, it’s worth mentioning that we have an annual benefit Farm Dinner event called In the Vineyard & On the Farm . If you’d like to experience our Cafe Farm and our Bernat Wines firsthand click here for information. It’s a beautiful event that sells out every year, so if you’re interested, don’t wait to reserve your seats! 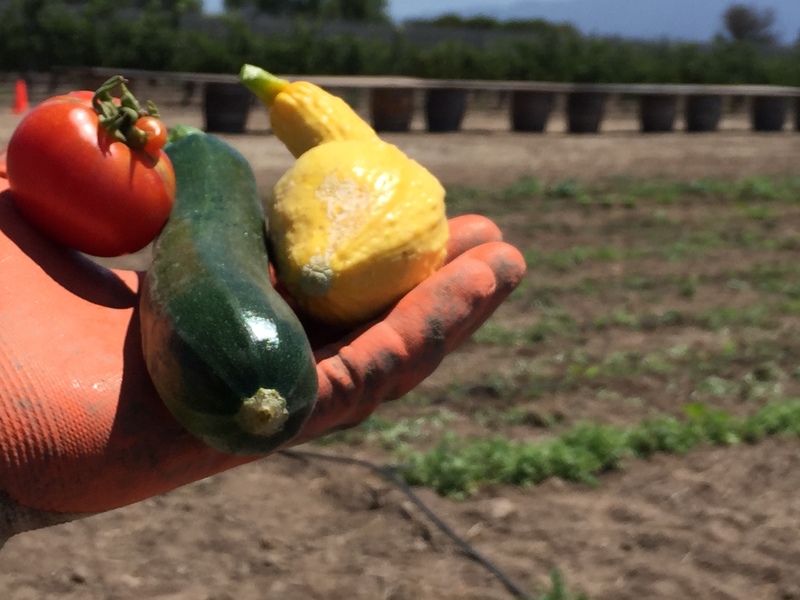 Announcing the Los Olivos Cafe Farm! 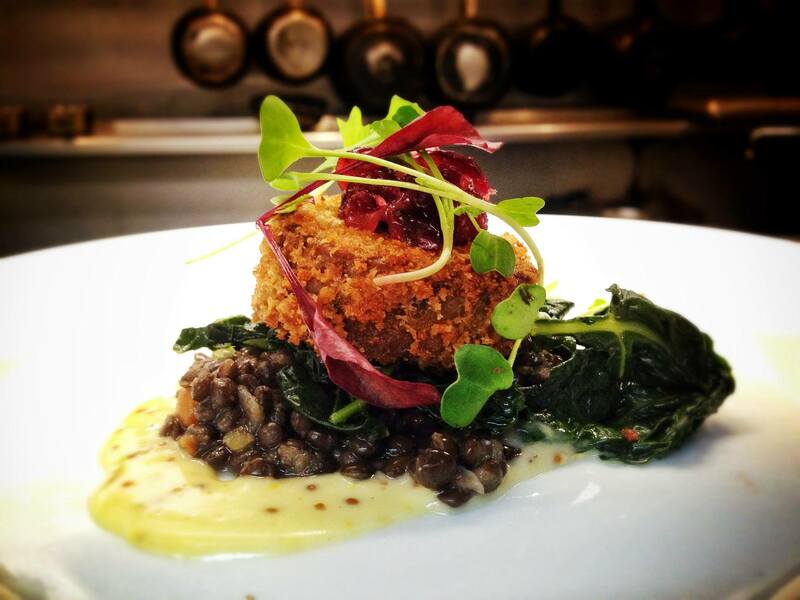 Sam and Shawnda, owners of the Los Olivos Wine Merchant & Café and Bernat Winery & Retreats, are long-time advocates of using fresh, locally sourced produce for the meals prepared by Chef Chris Joslyn in the Los Olivos Café kitchen. 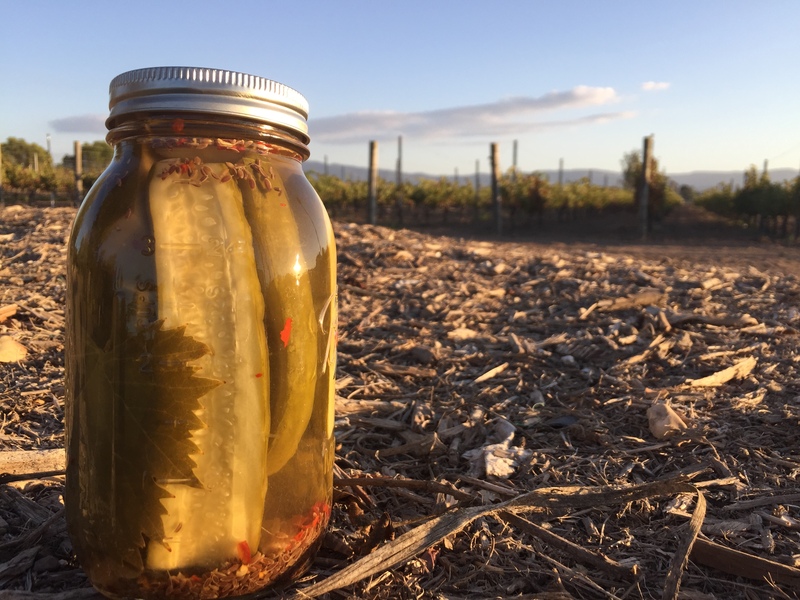 This passion has led them to focus on their own property and create the Los Olivos Café Farm. By utilizing their own land, they will now have the ability to grow many of the vegetables they need for the restaurant’s menu, flowers for arrangements on the tables and, as an extra bonus, offer extra produce canned into delicious, fresh product for sale exclusively in their Wine Merchant retail store. The opportunity to serve dishes incorporating vegetables picked from the field that morning, insures that guests dining at their restaurant will be enjoying produce at the peak of flavor. Matt McCurdy, also employed at Windmill Nursery, will be working with Sam and Shawnda on the farm. Growing up in Santa Barbara and later moving to Ballard before leaving in 1992, in his 20’s Matt was an environmental activist focused on protecting the remaining ancient forests in Northern California and Oregon. In his 30’s he worked as a project manager building affordable housing for low-income families. After being laid off, he decided to go back to the environmental roots of his 20’s and combine that with the skills he had learned as a manager. He followed his passion and went to work for an Organic Nursery in Texas, Redenta’s Garden, where he learned the ins and outs of Organic farming from co-workers who held masters degrees in Horticulture. 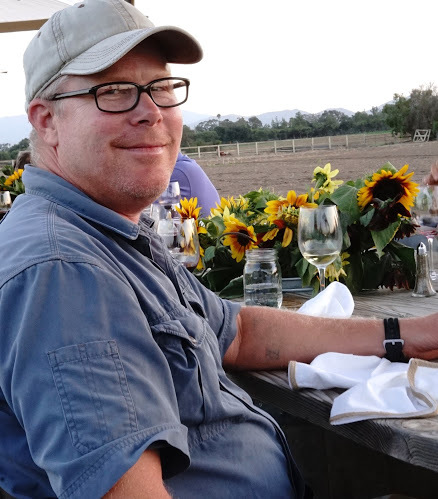 Since then, he has grown Organic vegetables in Texas, Northern California, and throughout the Santa Ynez Valley, converting lawn areas into vegetable gardens and raised beds. He is very excited that nine years later, his efforts are paying off with the opportunity to farm a large area. 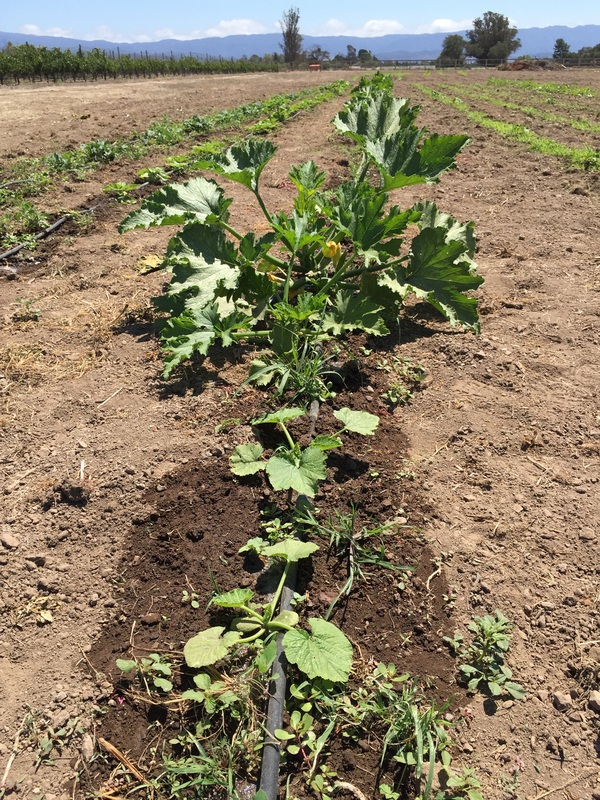 Currently, the Los Olivos Café Farm is growing Black Beauty Zucchini, Golden Zucchini, Yellow Crookneck Squash, Golden Beets, Kabocha Squash, Butternut Squash, Delicata Squash, Buttercup Squash, a variety of carrots, various Green and Purple beans, Sunflowers, Zinnia’s, and Cosmos. In addition, salads will be created from the Romaine Lettuce, Red Sails Lettuce, Oak Leaf Lettuce, Toscano Kale, and Smooth Leaf Spinach, while cucumbers will be used for both fresh in salads and canned for pickles. August 8 dawned with perfect weather for a late summer afternoon event celebrating locally sourced food and wine! Held at the Bernat Vineyard in Los Olivos under clear, blue skies with just the right amount of warmth; “In the Vineyard & On the Farm” was beautifully orchestrated by Sam and Shawnda Marmostein to showcase the bounty of their own vineyard and neighboring farm “The Garden Of…” owned by Shu and Debby Takikawa. 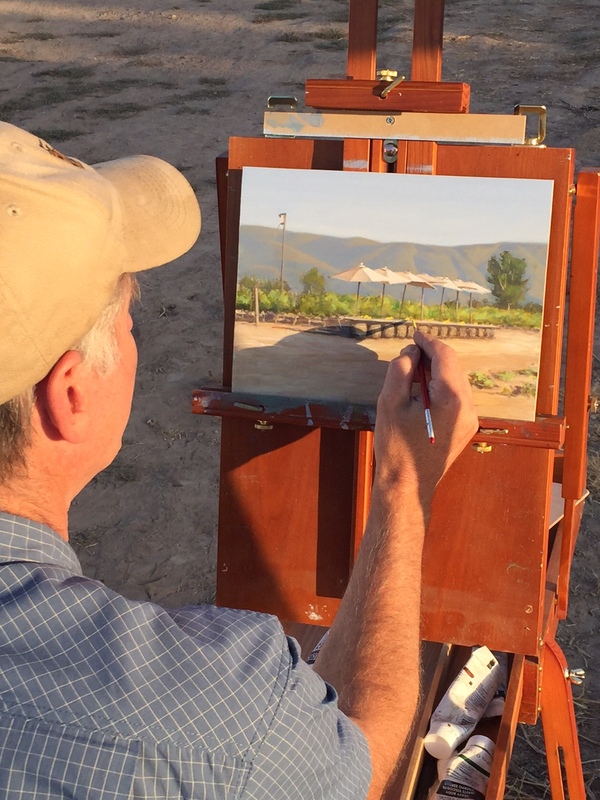 Moving toward the entrance, guests were first introduced to local artist George Lockwood, in the field, actively working on an original plein air oil painting featuring the long community dining table, set with bright umbrellas and intensely yellow sunflowers, freshly picked the day before, against the green leaves of the vineyard beyond. Conveniently situated nearby, guests were able to check back in as the afternoon progressed and George worked toward completion. The finished piece was offered up over dinner in an auction, eventually selling for $2,000, with proceeds going to support the Jewish Foundation. 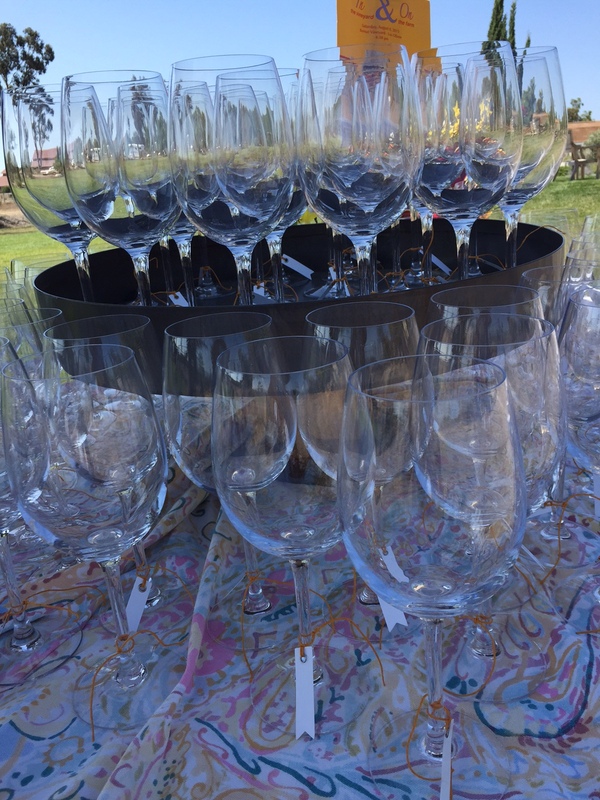 At the check-in table, Shawnda warmly greeted each guest upon arrival, explaining the activities coming up and answering any questions before handing them a wine glass and encouraging them on toward the lawn overlooking the vineyard. 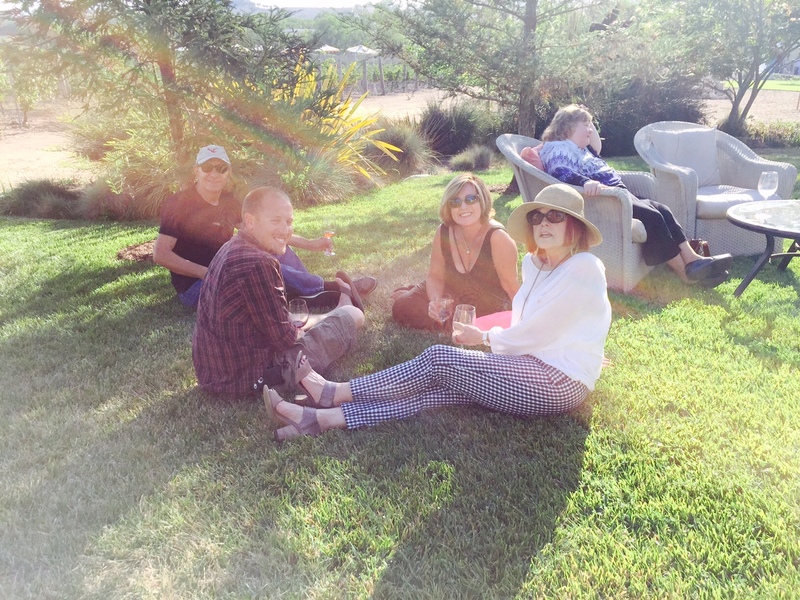 The terraced gathering spot was the ideal location to relax and greet friends new and old after choosing a favorite varietal of Bernat or Tercero wine to sip. Tantalizing appetizers passed by the Los Olivos Café staff, hinted at the delicious farm fresh meal yet to come, while the casual atmosphere encouraged conversation among guests waiting for an opportunity to tour the vineyard with Sam. Sam and Shawnda bought the property in 1995 and began planting their vineyard. Sam had been creating wine with friends, and he wanted to continue the practice using his own grapes. He enjoys the cycle of winemaking and the ability to gaze out of his windows overlooking the vineyard and instantly know what time of the year it is by the look of the vines. Currently they have 3 ½ acres of CCOF certified organic vines from which they produce a Rose, with Nebbiolo grapes grown on 19 year-old stock, and a Syrah each year for Bernat Estate Wines. Everything is done by hand; they pick the fruit and bring it up in buckets to the destemmer and then to ferment. Finally they press the grapes and after the wine has aged appropriately, they bottle on site. During the tour, Sam encouraged guests to taste the grapes currently going through veraison. Not quite ready for picking, Sam will continue to test them daily until he finds the optimal flavor and acid balance needed for award winning wine. After the vineyard tour, the group was invited to take a ride on a flatbed trailer decked out with hay bale seats for a fun trip to the Takikawa farm next door. 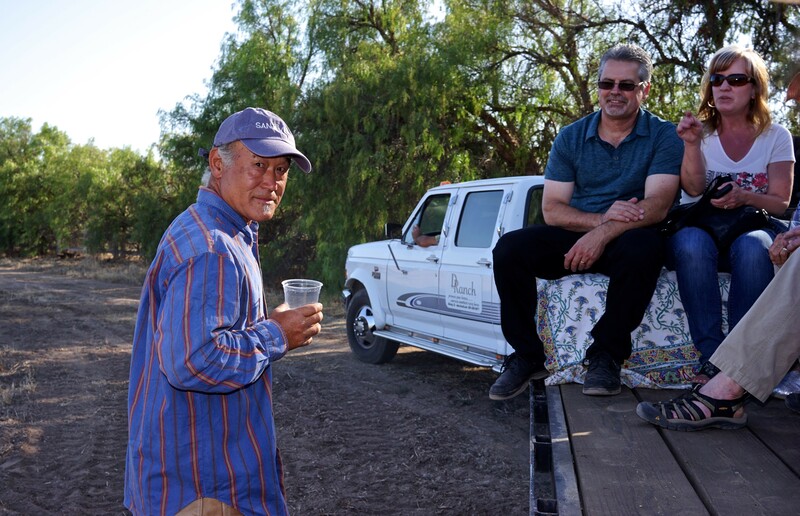 Shu Takikawa offered interesting insight into his organic farming practices. He has been a farmer for 32 years, and his expertise has resulted in produce that is sought after at Farmer’s markets and restaurants locally and in Los Angeles. The evening’s meal would start with a wonderful salad freshly picked from his fields and filled with baby lettuces, cherry tomatoes, pickled carrot, and Japanese Cucumbers. 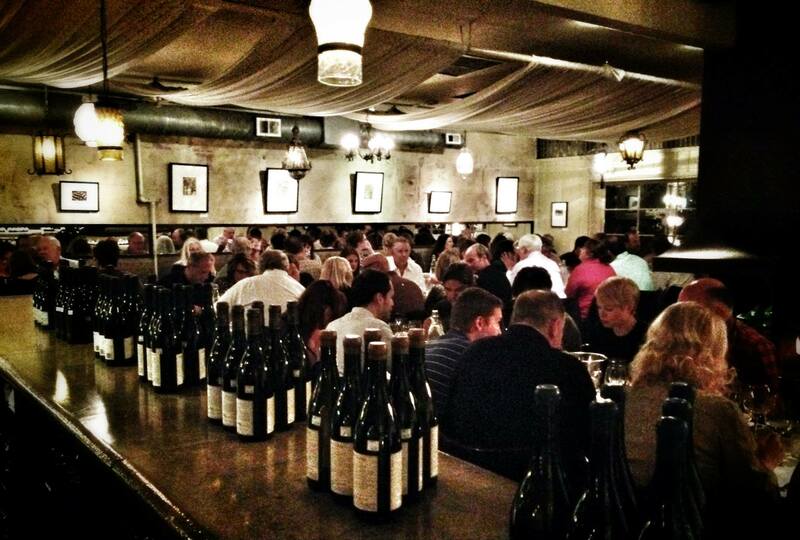 With the return to the vineyard, guests were invited to take their seats at the community table. A Bernat Grenache Blanc 2012 from the Santa Ynez Valley, Camp 4 vineyard was poured to accompany Farmer Shu’s salad, brightly dressed with a tangy, tarragon vinaigrette with tarragon grown in Shawnda’s herb garden. The delightful beginning to the meal, paired with the cooling fresh air as the sun set behind the fields, encouraged new friendships between guests seating along the table. And, by the time the main meal was served, everyone felt as if they had been fast friends for many, many years. In addition to Farmer Shu’s salad, Los Olivos Wine Merchant & Café’s Chef Chris Joslyn served a tender Hollister Ranch grass fed rib eye, garnished with seared tomatoes, green beans, and summer squash from Shu’s fields, along with basil olive oil smashed potatoes. 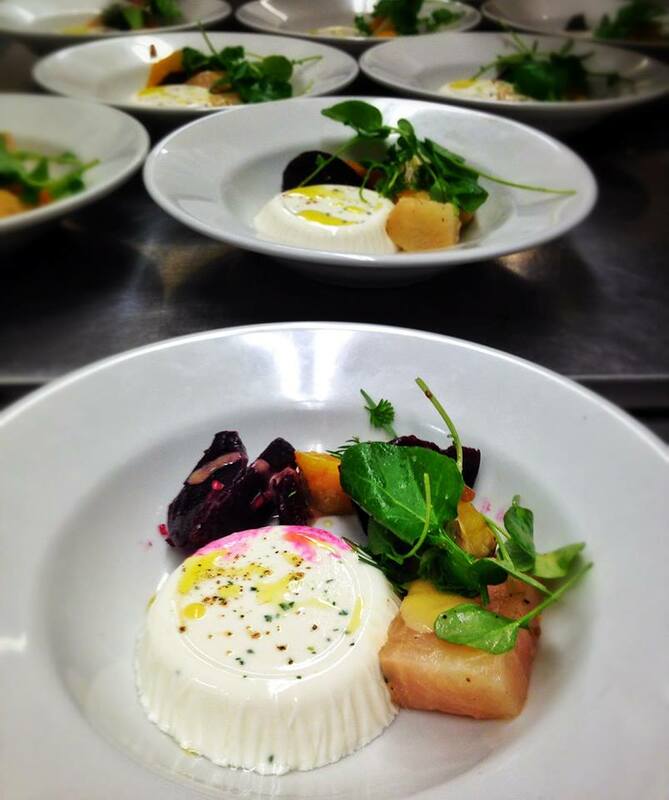 Paired with Bernat’s ‘Intrigue’ 2010 Estate Syrah, guests lingered into twilight, until finishing the evening with a Lavender Panna Cotta, made with Lavender from Sam and Shawnda’s property, topped with locally sourced berry compote. As dusk drew the event to a close, guests made their goodbyes and offered heart-felt thanks for a wonderful time to hosts Sam & Shawnda for a truly unforgettable evening. Great wine starts with a great story. A vineyard tells us a story through its soil and its climate; the farmer frames this story with agricultural tradition and the stewardship of the land; and the winemaker captures both of these stories, along with their own imprint of self and style. This past Thursday we held a special event at the Café called Under the Influence that sought to give four local winemakers the opportunity to tell their stories and the stories of the wines that have inspired them. It was a night that exceeded my greatest expectations. South African native Ernst Storm began the evening by pouring his 2012 Presqu’ile Vineyard Sauvignon Blanc alongside Ashbourne’s 2008 “Sandstone,” a blend of Sauvignon Blanc, Chardonnay, and Semillon grown in South Africa’s Hemel-en-Aarde Valley. The latter wine was crafted by Storm’s brother Hannes, whose wines under the Ashbourne and Hamilton Russell labels are some of the most acclaimed in South Africa. While one could see a certain similarity between the two, the overall contrast was striking. Storm’s youthful Sauvignon Blanc, grown in the extremely sandy soils and cool climate of Santa Maria Valley’s Presqu’ile site, was bright and fresh, with its pyrazine notes of grass and jalapeño accented by guava, gooseberry, and a really unique hint of oak. As it turns out, that noticeable oak accent comes from the use of acacia barrels, which also provide a distinctive textural presence to the wine. The Ashbourne, on the other hand, 4 years older, was already developing some tertiary nuances, with notes of lanolin, beeswax, and bruised apple starting to appear. Nevertheless, the varietal character was unmistakable, possessing a similar herbaceous character as the Storm, joined to wet-stone minerality (sandstone soils here) and a more voluptuous texture. The most fascinating thing for me about tasting these side by side was to see the shared family passion from these two brothers, and the level of commitment they both bring to their different projects. While the winemaking details may be different, they are united in their desire to express site as clearly as possible. Our next course saw the team from Liquid Farm sharing their 2012 “Golden Slope” Chardonnay next to Francois Carillon’s 2011 Puligny-Montrachet. Liquid Farm’s goal from the outset has been to create a domestic interpretation of the wines they had fallen in love with from Burgundy, so their choice came as no surprise. The differences between the two wines were, as with the first course, quite vast. The Francois Carillon, despite a splash decant, was still a bit reduced, showing a fairly high amount of SO2 on the nose. I have found this character in quite a few 2011 white Burgundies, which may be in response to all of the premox issues that have plagued the region over the past decade. Overall, though, Carillon’s Puligny was incredibly precise and soil-driven, with an intense mineral presence. I was pleasantly surprised to find that the “Golden Slope” bottling still came across with admirable restraint and balance against one of Burgundy’s benchmark producers. The fruit and textural power of the wine were unmistakably California, traits I believe should be celebrated, and the minerality of the Sta. Rita Hills in all of its saline glory was an intriguing contrast to the limestone origins of the Carillon. Paired with Barramundi and Manila clams, both wines were delights to ponder and savor. Wes Hagen of Clos Pepe chose to honor our local pioneers for the third course. The Pinot Noir from his estate has become a modern benchmark in American wine, with examples from his own label as well as those purchasing his fruit achieving great recognition. 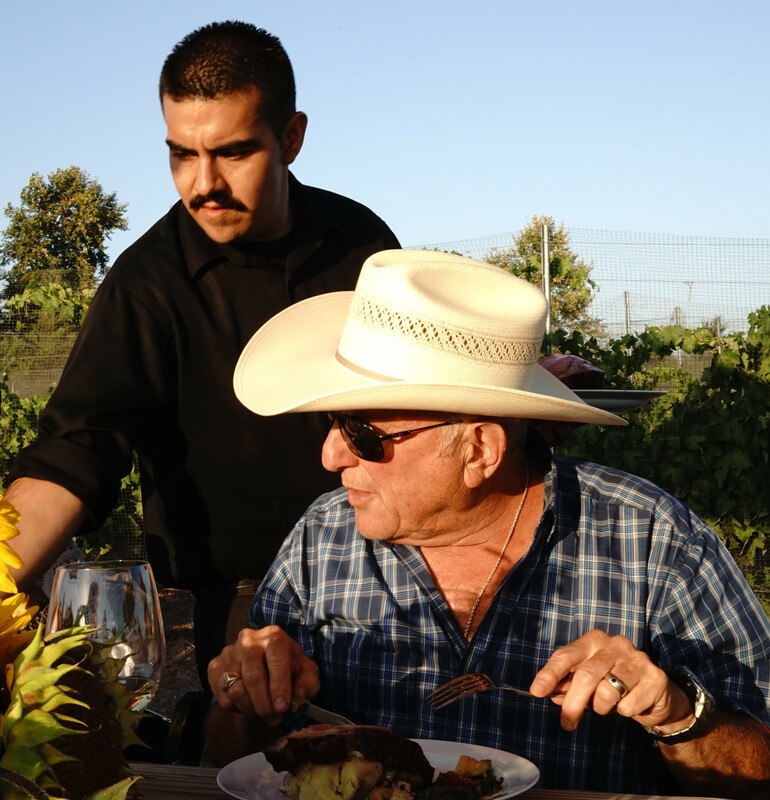 He poured a 2006 Longoria “Fe Ciega Vineyard” Pinot Noir next to the 2010 Clos Pepe Estate, and spoke of Rick Longoria’s influence on his own path as a farmer and winemaker. He also honored two other local innovators, Bryan Babcock of Babcock Winery and Jim Clendenen of Au Bon Climat. It is sometimes easy to overlook the originators in favor of the hot new thing, but these three men are still crafting some of the most site-driven, balanced wines in Santa Barbara County, so it was beautiful to see Wes, who himself is a bridge between the first generation and our current new crop of young winemakers, honor this trio. The wines shown wonderfully, with the power and richness of the heat-spike-affected 2010 Clos Pepe contrasting nicely to the more developed, earthy Fe Ciega bottling. Smoked Square Cut New York Steak with Mushroom & Spinach Strudel and Truffle Port Sauce. While all of the wines on the night were complex and worked beautifully at table, the final course was perhaps the highlight for me: The 2010 Luminesce Syrah from Thompson Vineyard next to Domaine du Coulet’s 2010 Cornas ‘Brise Cailloux.’ Thompson Vineyard is one of the great sites of Santa Barbara County. Tucked back into Los Alamos Valley’s Alisos Canyon, the Syrahs from here are legendary, with a structure and precision rarely found outside of the Northern Rhone. Luminesce’s rendition leans toward the Old World in its balance and approach: just 13.4% alcohol, it was fermented with around 30% whole clusters and aged in puncheons. The wine showed amazingly well, with white pepper, gravel, smoked meat, and blueberry on the nose, along with a poised, beautifully structured palate. The overall balance in this wine could easily stand head to head with the greats from Hermitage or Cornas, and on this night it did just that. Coulet’s Cornas is a personal favorite, and for me captures the essence of this tiny appellation. The 2010 did not disappoint, with aromatics of iron, kalamata olive, blood, and bacon leaping out of the glass. There was also a touch of Brettanomyces, which sparked an interesting discussion among the winemakers. Luminesce’s Kevin Law somewhat jokingly said that he liked a little “imported Brett,” i.e. bretty wines from the Old World, while others found the Coulet close to their threshold for tolerance. Personally, I thought it added to the wine, particularly texturally, and was a great example of how a flaw can actually enhance a wine’s beauty. With smoked New York steak and mushroom & spinach strudel, it was an incredible end to the night. The evening was deeply moving both emotionally and intellectually. Giving these winemakers an opportunity to discuss their inspirations allowed us to see their joy and passion as tasters, and hear the stories behind their influences. It can be easy as professionals in the wine business to get bogged down in the minutiae of winemaking or French Appellation law. This evening was such a treat because it allowed all of us a return to the pure elation as imbibers that made us fall in love with wine in the first place.